Note: I received free copies of the Non-Human Player Codex (just the Codex from here on out) for both Swords & Wizardry Complete and Labyrinth Lord, as a thank you for advice I gave the author (Noah Green). The Codex presents a nicely organized set of options for demi-humans, including racial abilities and optional traits meant to add nuance to the player characters. Each race has a page that describes all of their racial abilities and level limits. While you could just use the rule book, this addresses one big issue, that of standardization. 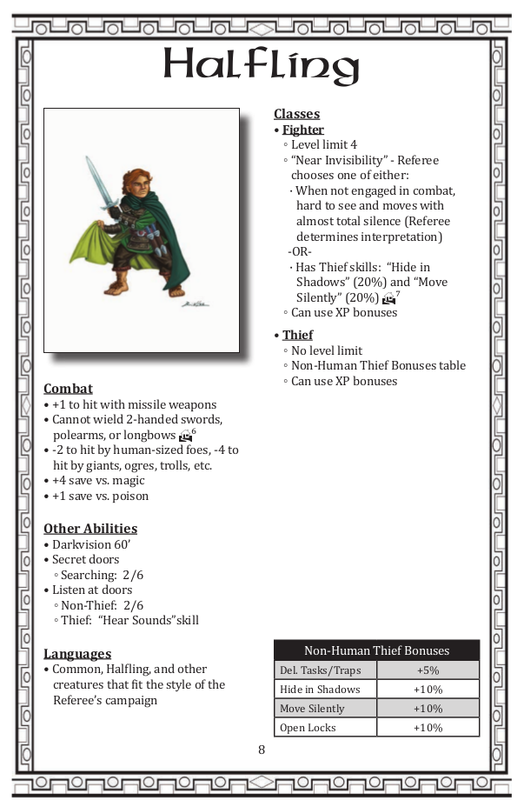 For example, Halflings in S&W Complete don’t officially get the “near invisibility” that is often just house-ruled as an addon, since it is in S&W White Box and in all of the original and classic D&D rules. So it’s added as an option. 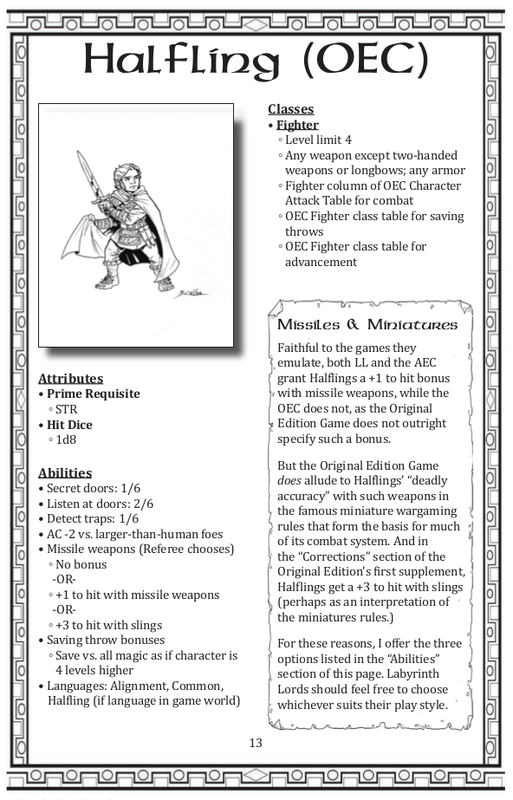 In Labyrinth Lord (L L) Original Edition Characters (OEC), the Halfling doesn’t receive the missile weapon bonus that they get in core LL or the Advanced Edition Companion (AEC), so it’s also added as an option. 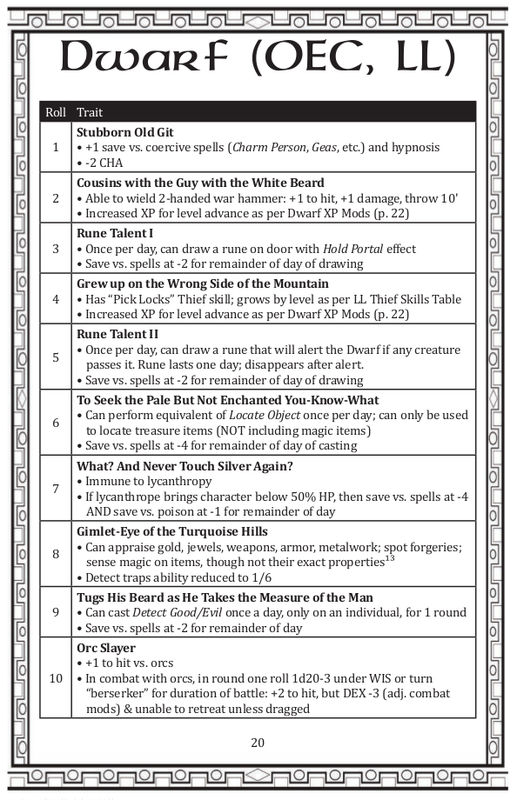 I could see this being very useful for open table games – I would just hand out copies of the sheet for a PCs race as a reference. The optional traits are, well optional of course, and have a sort of minor sub-class feel. Each option gives some small bonus or skill, and one associated drawback or additional XP requirement. There is also some nice humor evident in the various lists of traits. For example, one of the Dwarf traits is “Stubborn Old Git”, and gives Dwarf P Cs +1 on saving throws versus charm or geas spells, but also imparts -2 to Charisma. I can see it being quite fun to roll for a random trait during character creation. Apart from the standard races, there are Gnomes and Half-Orcs presented as options in the S&W Complete version (they could also be used if you’re playing with the S&W Core rules). The art and layout are well done, and it is obvious the author did his research – there is a ‘Further Reading’ section for those who want to find other options for demi-human PCs, as well as a detailed bibliography (I also remember his detailed questions in the forums). All-in-all these are a great resource. You can get copies of the Codex for S&W Complete, S&W Light and Labyrinth Lord at RPGNow, currently they are all free or pay-what-you-want. Doug, thanks so much for this kind, thoughtful, and wonderful review! It really made my week. I could not have written these books without your advice! Looking forward to sharing this review with my friends and family. You’re welcome! You’re producing some good quality supplements and I hope you continue! Thanks so much – that means a lot to me coming from you! OK, I will!